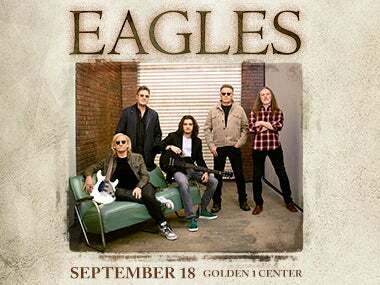 SACRAMENTO, CA – The Eagles – Don Henley, Joe Walsh & Timothy B. Schmit, with Vince Gill and Deacon Frey – have added six more "An Evening with the Eagles" concerts, including a performance on Tuesday, September 18, at Golden 1 Center. Tickets for the Sacramento show are $229.50, $149.50, $99.50 and $49.50 for reserved seats plus applicable charges and go on sale Friday, February 16 at 10 a.m. through Ticketmaster.com. American Express® Card Members will have the opportunity to purchase tickets before the general public beginning Tuesday, February 13 at 10 a.m. through Thursday, February 15 at 10 p.m. A limited number of Lane One VIP Packages will also be available, including great seats, transportation, preferred entrance and more. Additional presale opportunities will be available beginning Thursday, February 15 at 10 a.m. For complete ticket information, visit Eagles.com. The EAGLES are one of the most influential and commercially successful American rock bands of all time. With their profound lyrics, soaring harmonies and country-tinged melodies, they created a signature Southern California sound. The Eagles have sold more than 120 million albums worldwide, have scored six #1 albums and have topped the singles charts five times. The band has been awarded six GRAMMY® Awards. The Eagles have performed sold-out concert tours worldwide throughout their career. The band's 2014 History of the Eagles Tour broke numerous U.S. box office records and included five sold-out concerts at Madison Square Garden in New York, NY and six sold-out concerts at the Forum in Inglewood, California. The Eagles were inducted into the Rock & Roll Hall of Fame in 1998 in their first year of eligibility and received the Kennedy Center Honors in 2016.